In this episode I have the delight of connecting with Dennis Wittrock (left) from Germany and Bence Gánti from Hungary. Together they are leading the Integral Europe initiative, a community of knowledge and practice that aims to “embody, represent, teach, develop and give voice to integral consciousness and its resulting practical applications on a European basis” (from their website). In this regard they are currently in the process of organizing the first European Integral Conference which will be held 8 – 11 May in Budapest, Hungary. If you are totally new to the integral discourse I would highly recommend that you first read the introductory article by Sean Esbjörn-Hargens (see below). Dennis and Bence start of by sharing their background and the ways in which they became involved in the integral scene, before going into what they envision for the upcoming conference. For instance, how can the different projects, groups and initiatives that we see spread out in Europe come together and contribute something to the integral commons? Bence goes on to explore what an actual integral conference would look and feel like. How can we transcend the constraints of traditional conferences and give space to different modalities of inquiry and holistic modes of exploration? Dennis follows up with emphasizing the value of creating a nurturing holding environment for these types of events, and he describes how the organizing group is working internally amongst themselves to strengthen their relationships and to deepen their own personal engagement. 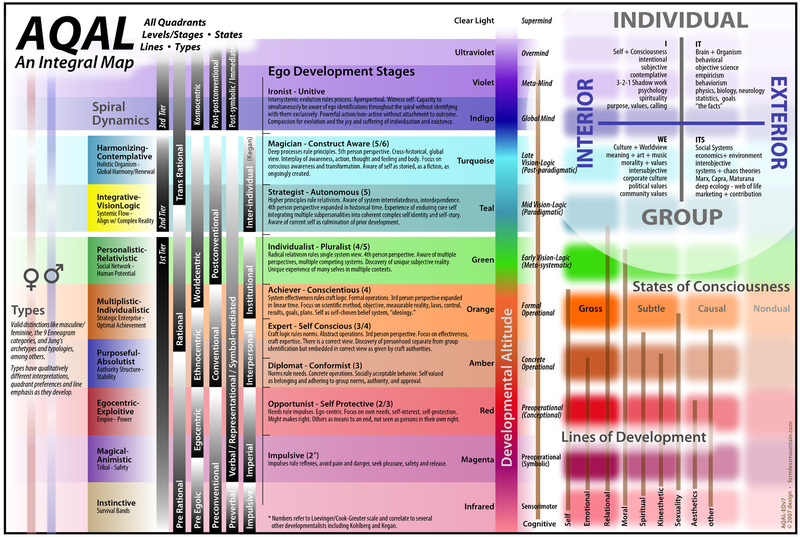 Another interesting theme that they point out is how we can truly integrate all the levels in the spiral (referring for instance to Spiral Dynamics, see chart below), and maybe especially the “green level” which is all about sharing, bonding and creating pathways between the minds and hearts of people involved. The integral movement has often criticized the “green meme”, but could it be that the integral movement is actually under green, and in this regard, truly in need of owning and growing into this level of psycho-social development? Further on we explore the fabric and potentials of a European identity, inquiring into how one could start to vivify a true European sense of soul. What does it actually entail to be European? Also, could it be that the labels and assumptions we attach to each other are creating unnecessary division? And how can we create a fertile ground for unification and coherence amongst all the people on the European continent? Following up on this theme we explore the possible unique voices and flavors of a European integral perspective. In what ways can the different European cultures contribute to the overall global commons of integral theory and practice? Towards the end we explore the potentials of the overall initiative through a little exercise where we let go of all our conceptualizations and just listen to what wants to emerge. Here is an article from the Guardian that has caused some row, at least in Norway. It uses some very common stereotypes to describe certain aspects of Scandinavian society. If nothing else, the author does address the issue of cultural shadows in the Scandinavian countries. Nevertheless, I´m thinking we could engage these topics in more intelligent ways. We enjoyed listening very much and Heidi got inspired to think about an “integral canon” that could be the leitmotif of the Budapest event. More about that on Sunday when we meet live online. For my part, I began to think about my tribe (America) and how it might have to await a meta-view to arise after the deposition of the old Colorado-centric “regime.” all in good time. Hi Mark! Interesting point about the “integral canon”. I suppose such a canon would benefit from contributions that are truly global, in terms of which primary “tribe” someone is speaking from. Again, how does integral look and feel like from a Russian perspective, what academic, cultural and philosophical nuances could a Norwegian practitioner bring to the table etc.? Also, I´m thinking such a canon could benefit from including pieces of work produced by people that are thoroughly situated outside the integral community. My sense is that many disciplines (for instance geography, which is my academic background) are steeped in integral-like perspectives, at least integrative. I suppose delineating what is integral and what is “integrative” would also be relevant to discuss. Glad you enjoyed the podcast! Thanks for your observations, James. And, yes, we did enjoy the podcast. You bring up many interesting and pertinent points which we can’t consider thoroughly just now. But Heidi will bring up the subject on Sunday when we will meet online and live with several involved in the direction of the Budapest event. I just read Susann Cook-Greuter´s paper “ASSUMPTIONS VERSUS ASSERTIONS – Separating Hypotheses from Truth in the Integral Community”, that was recently published in the Journal of Integral Theory and Practice. She shares some really poignant thoughts and questions regarding collective assumptions in the the integral scene. Coming back to the idea of an integral canon I believe Susanne´s perspectives are pertinent in this context. Highly recommended! Here is a video from 2004 with Bence Ganti asking Ken Wilber “what is your vision for integral?”. Interesting reflections from Ken..